The 2003/04 season started very quietly, with almost no activity during the winter months right up until the end of September. But from the hailstorm on the 26th of September, things went wild from there! 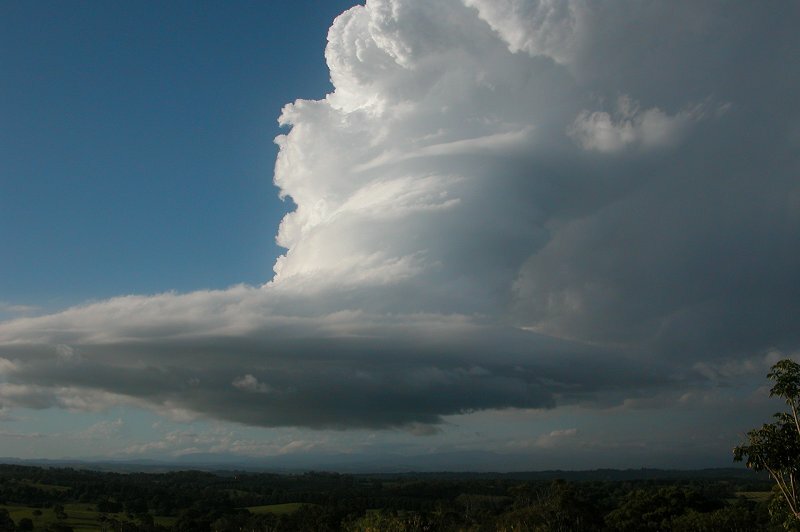 October saw more than 13 thunder days in the Northern Rivers, with a number of setups producing supercells. 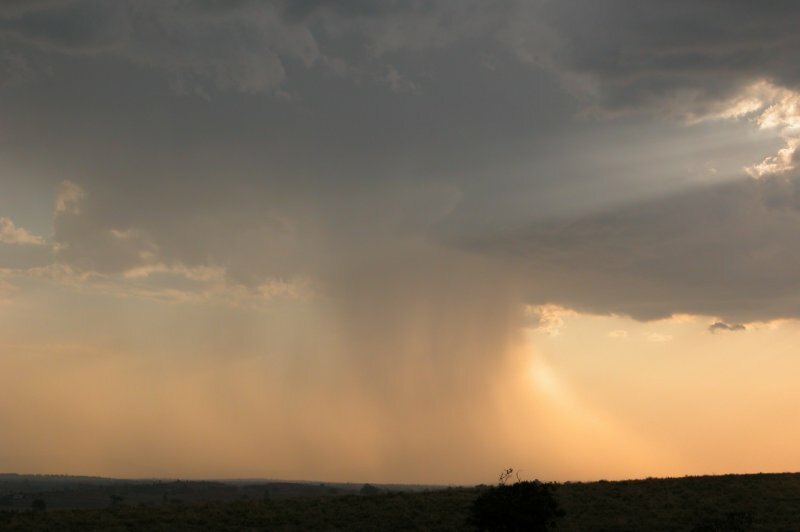 In one week, chasers witnessed an amazing sculptured low precipitation supercell, along with another low precipitation supercell with 6cm hail, and then a supercell which produced hail in excess of 10cm the very next day! Across the border, an F3 tornado was observed at Stanthorpe! It was one of the best beginnings to the season in a long time! 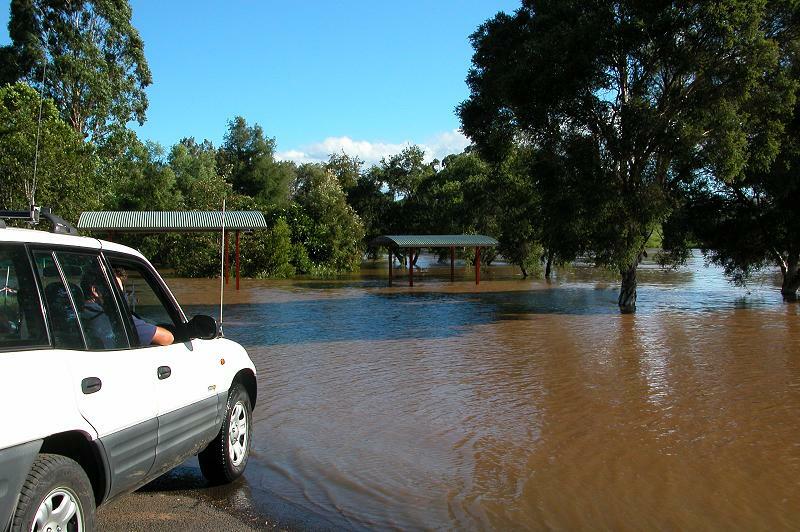 But then there was a lack of impressive activity right through until the end of January, when what is likely to have been a record number of consecutive storm days affected the Northern Rivers. Just about every type of storm feature was observed during the nine day period and was probably the best week of storm chasing ever experienced by chasers in the area! Things went quiet again from there, until a tropical low caused wild winds and flooding at the beginning of March. 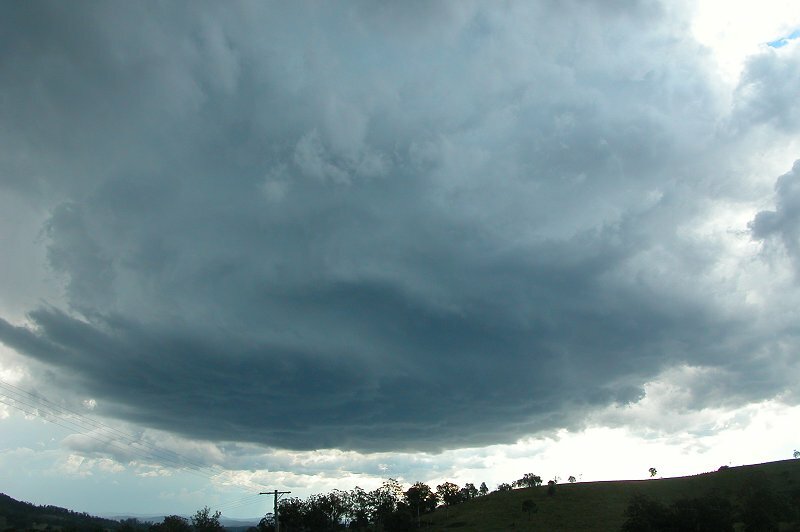 The season was finished with a possible HP supercell which caused damage in the region in mid March. It was another interesting season, with much learnt during the time spent observing storms. Below is a brief account of each storm day. Click on an underlined heading to see a full report of that day. 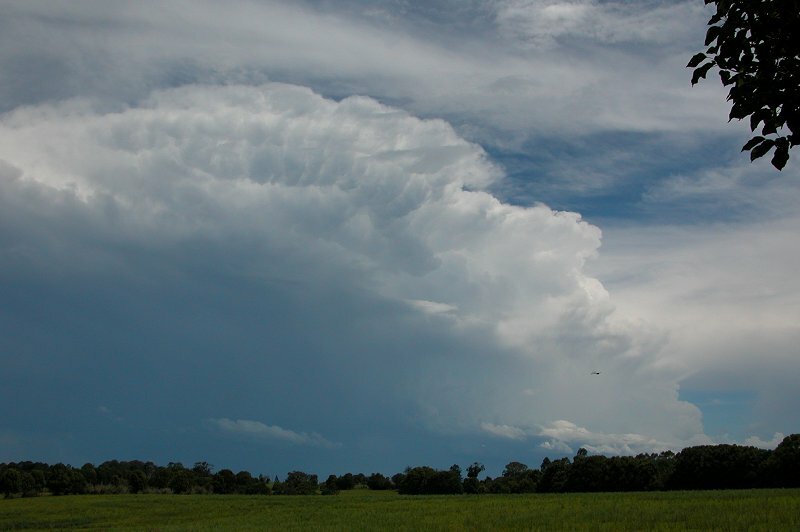 A weak surface trough in the region produced enough low level instability to kick off the first thunderstorms of the season, however the cells were very low topped. 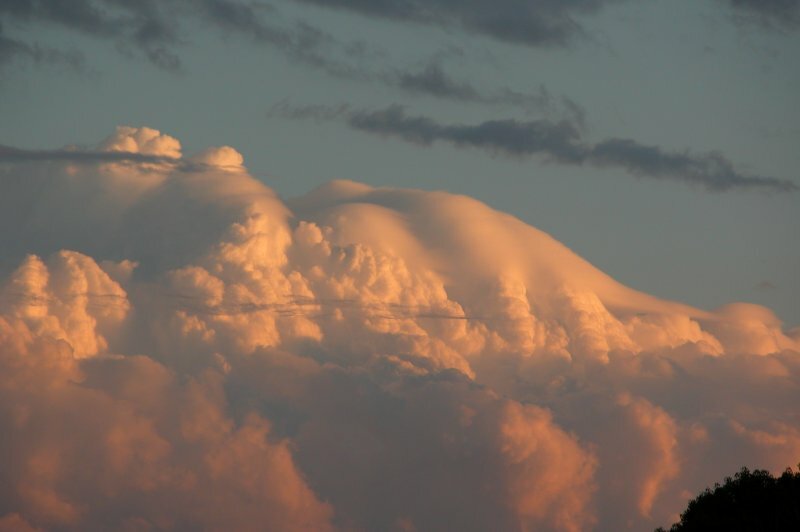 The highlight though was the large amount of pileus draped over updrafts on one cell. This became even better when the lowered sun illuminated the updrafts some lovely colours. 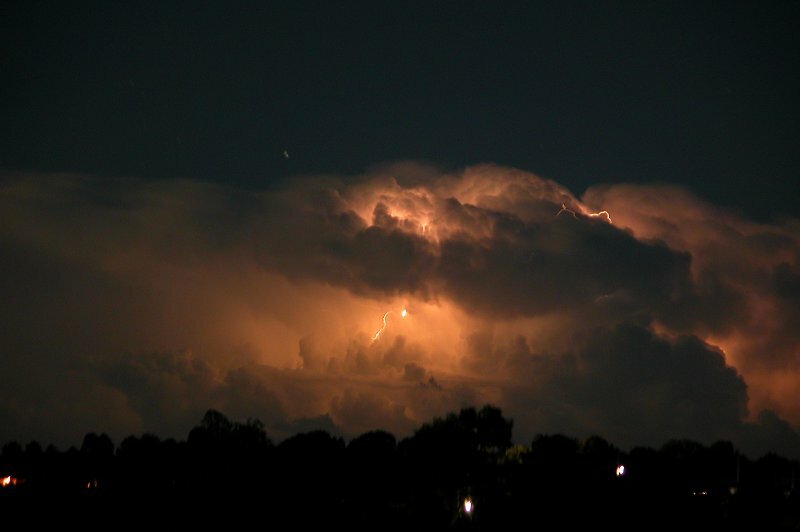 Some lightning was observed after dusk. 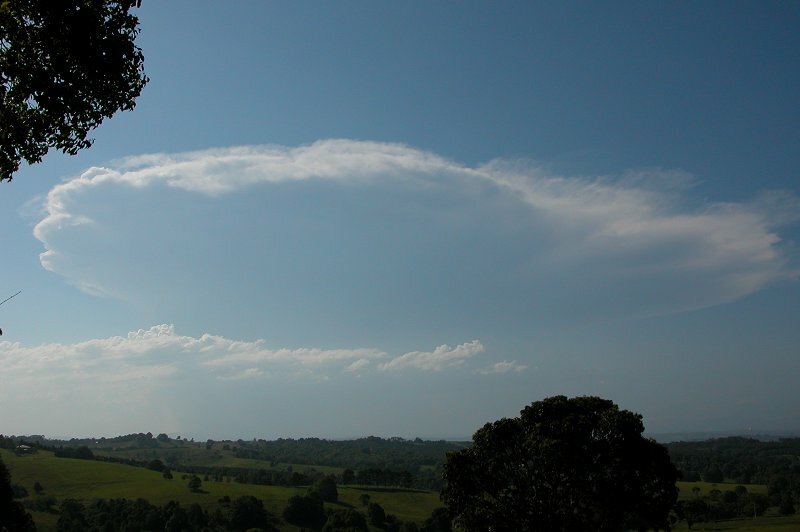 A marginally unstable atmosphere still managed to produce a very low topped thunderstorm in the Northern Rivers this Sunday afternoon. The cell, which developed W of Kyogle, moved over my location in Wollongbar, and the very dry atmosphere led to microbursts which gave some gusts over the 70km/hr mark, as well a producing some very brief heavy rain. The cells grew a little higher as they reached the coastline and gave some infrequent lightning which was thoroughly enjoyed. An approaching dryline and a relatively unstable atmosphere had storm chasers, who had not experienced any storms for almost a month, very excited about the prospect of severe storms! However there was great concern there would be insufficient moisture for severe storms. Very weak, high based and low topped storms developed and moved through the region at midday, producing some thunder and small hail! 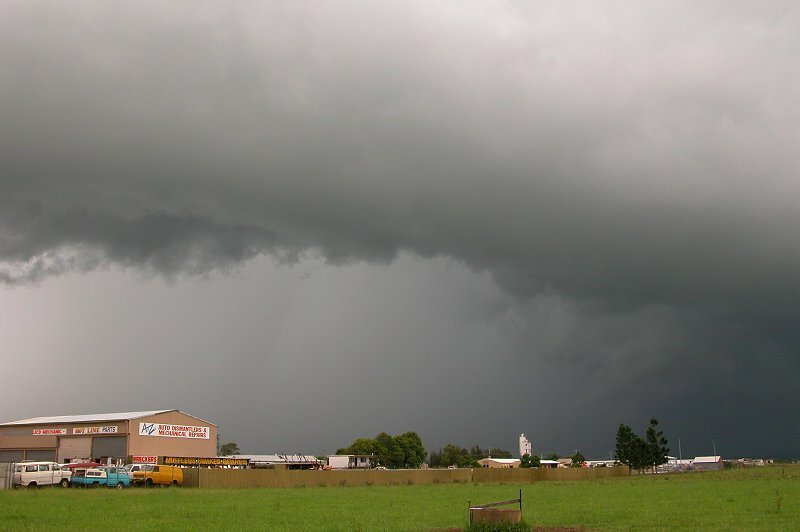 Storms remained fairly small until around 3pm when a number of severe storms developed throughout the northern parts of the Northern Rivers. 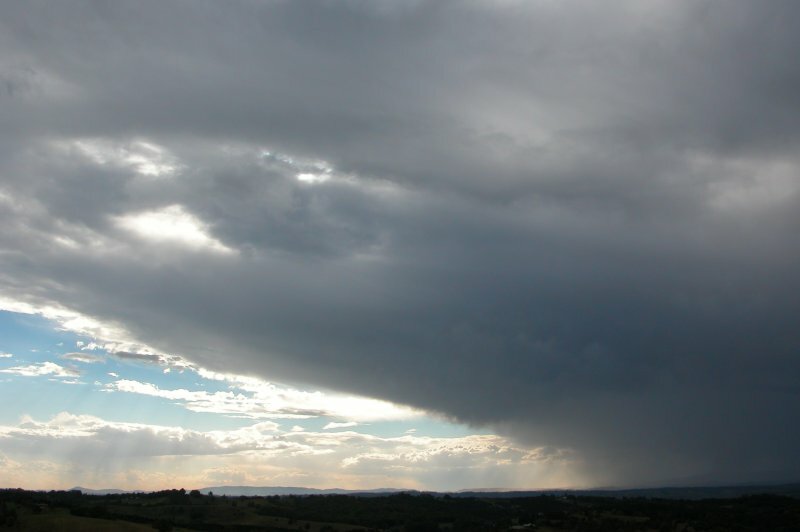 Of particular interest was a cell that moved through the western outskirts of Lismore, producing lots of hail around 2cm. It was great to finally get out on the first chase of the season and experience hail! 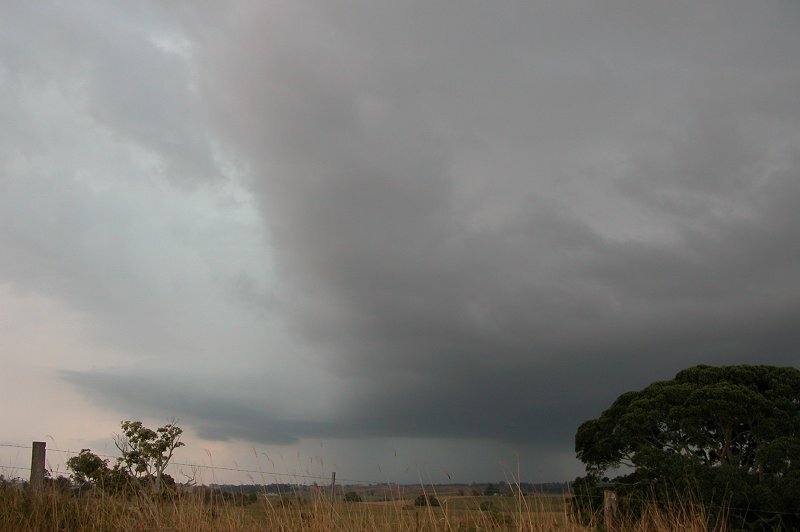 A cut off low had produced some very severe storms in western NSW the day before, with a large active squall line moving through the western districts. 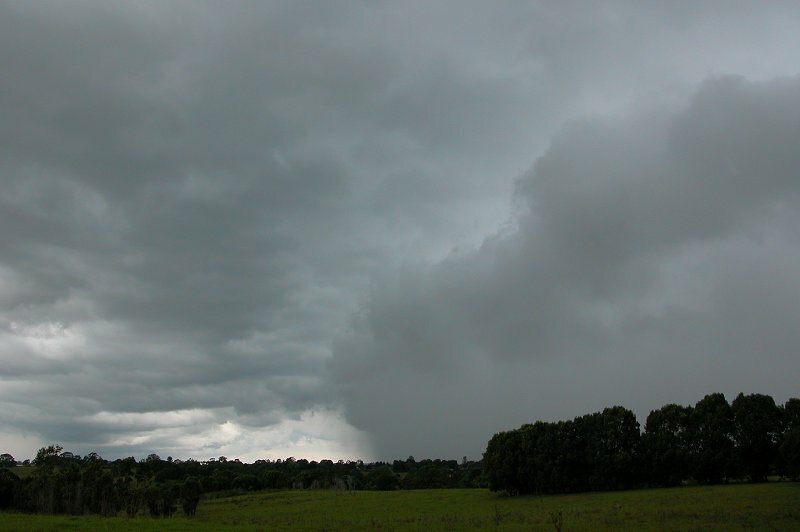 Another squall line was expected this day, and with shear almost off the scale, it was going to move quick! 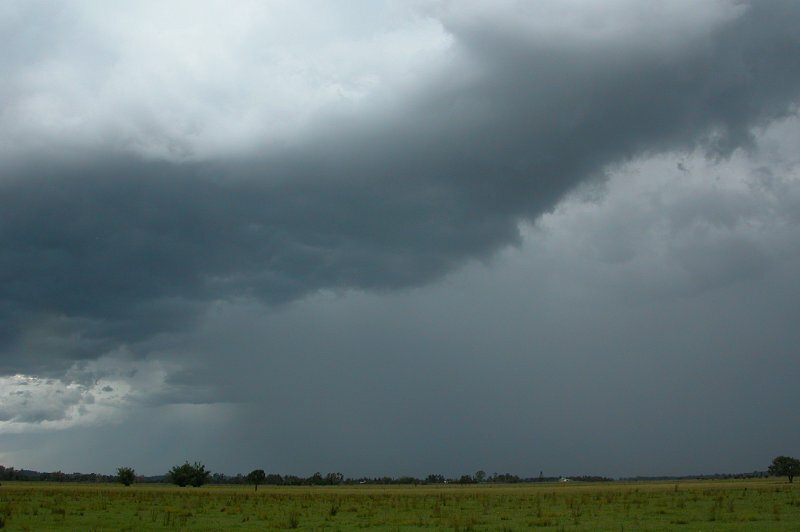 A squall line formed around midday west of Moree and traveled at around 80km/hr towards the coast. As the line moved through the coastal areas, severe winds lashed the area, with later estimates of damage to property and crops of over $1 million. Heavy rain was also associated with the storm, but the fast moving nature of the squall line meant totals remained fairly low. Certainly a severe storm to kick the official severe thunderstorm season off, but almost completely featureless! 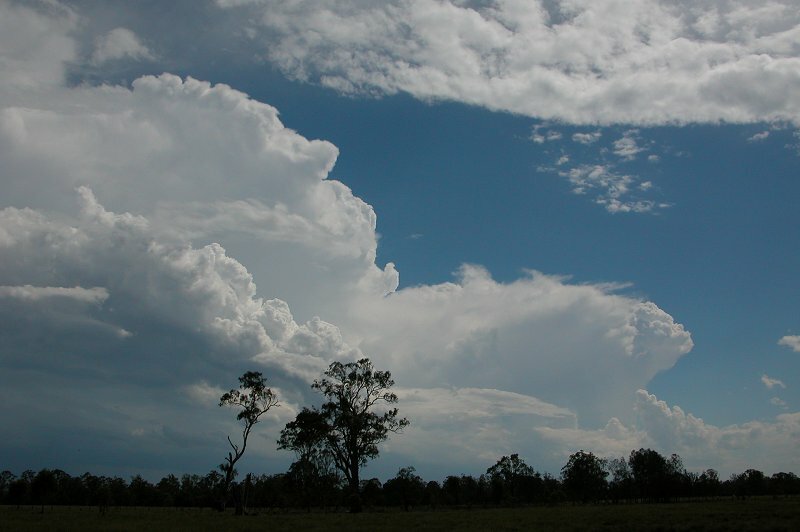 Mostly non-severe convection occurred from late morning onwards in NE NSW and SE QLD and gave a few hours of storms. 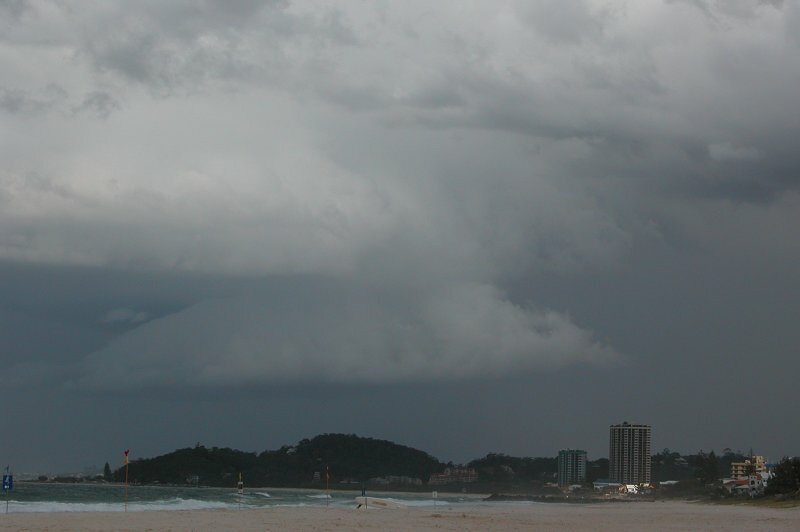 I was on the Gold Coast during the day and observed the storms in NE NSW from The Spit. 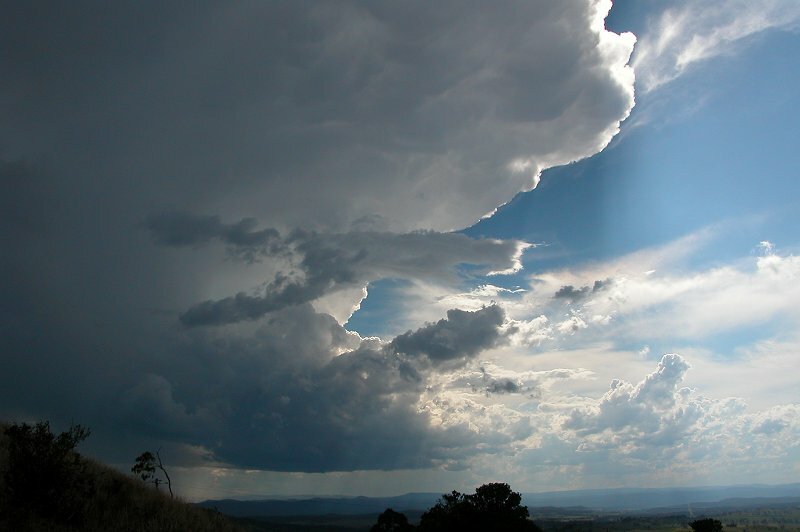 Some storms occurred around the Gold Coast but I didn't encounter anything significant. Some welcome rainfall at the least. 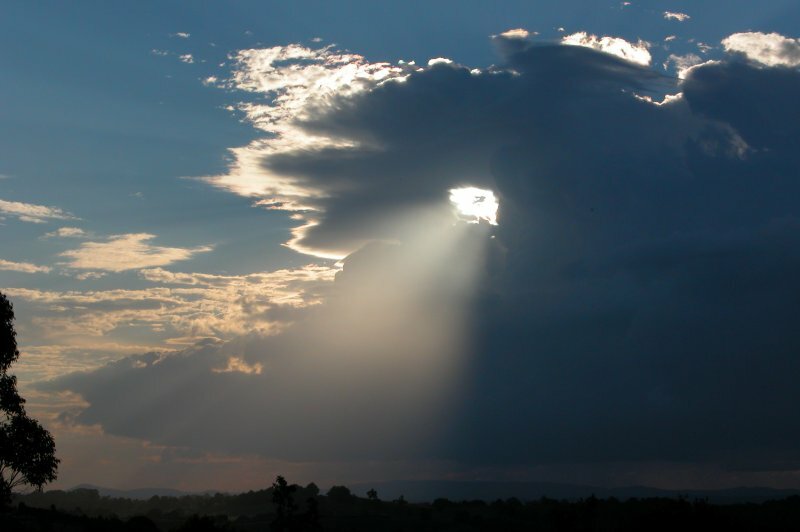 A southerly change that was moving up the coast was expected to kick off some weak evening thunderstorms. 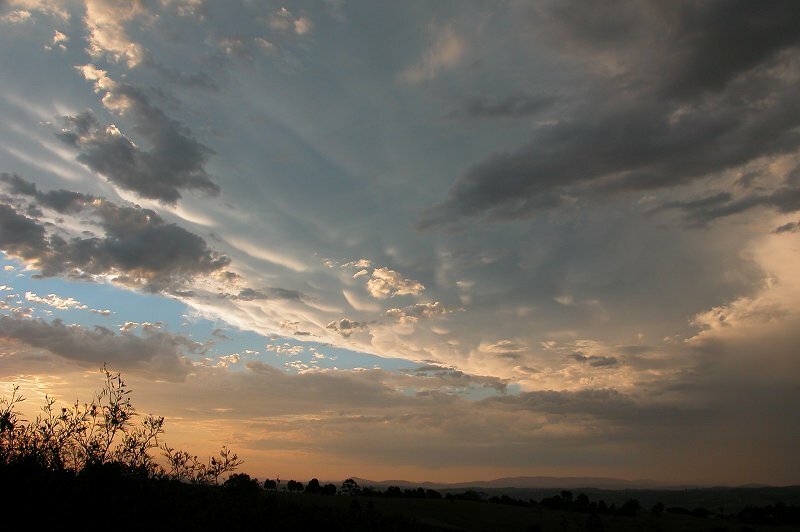 With such weak instability, severe storms weren't expected, however around 7pm a number of cells began developing in the western areas of the Northern Rivers. One cell in particular, NW of Grafton, quickly developed a red core on radar and slowly moved towards the Lismore/Casino area. A severe thunderstorm advice was issued for this cell. Of surprise was the almost complete lack of lightning from this cell. 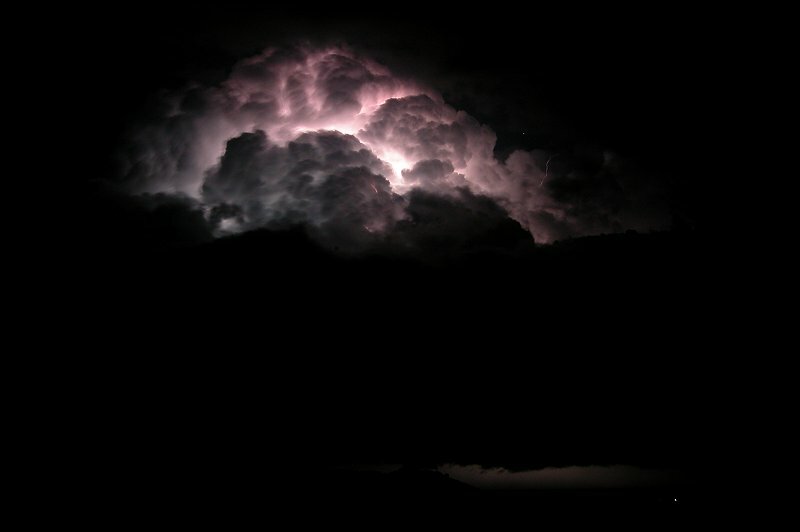 Initially it was producing lightning every 20 to 30 seconds, but it soon was 10 min between flashes! The cell did maintain a moderately sized red core nearly the entire 2 hour trip to the coast, where it veered right of it's NE track and hit just south of Ballina, producing very heavy rain and no doubt some hail. Instability was mainly offshore and it was looking marginal as to whether dry air would push through too early for convection to get going. By midday small storms were popping up around the Grafton region, with some going from nothing to red on radar in 10 minutes! Heading down to the Evans Head area it was looking like it would dry out, however some storms got going as they reached the coastline. 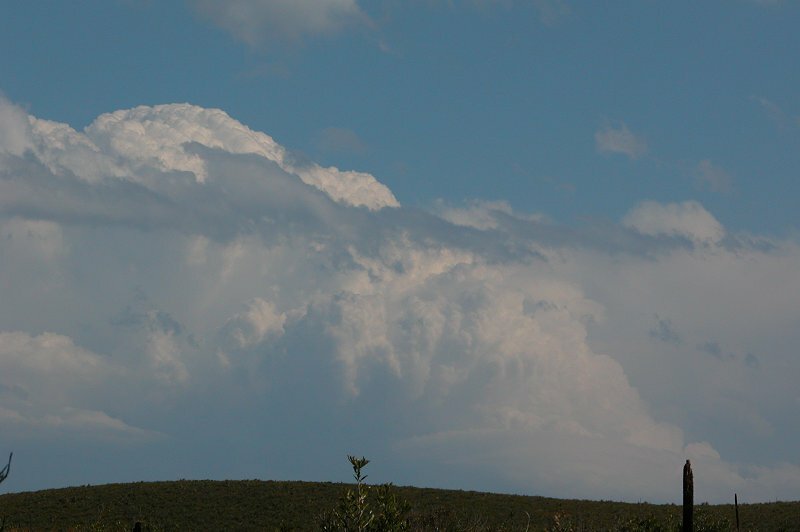 One cell south of Evans Head had a corkscrew updraft which was rotating long enough to make the cell a supercell candidate. Barely no precipitation was visible. 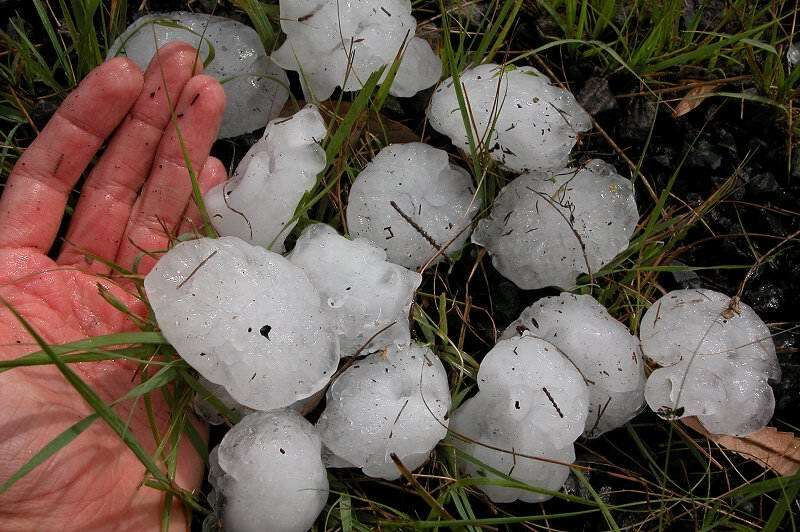 Golfball hail was reported in some towns along the coastline. 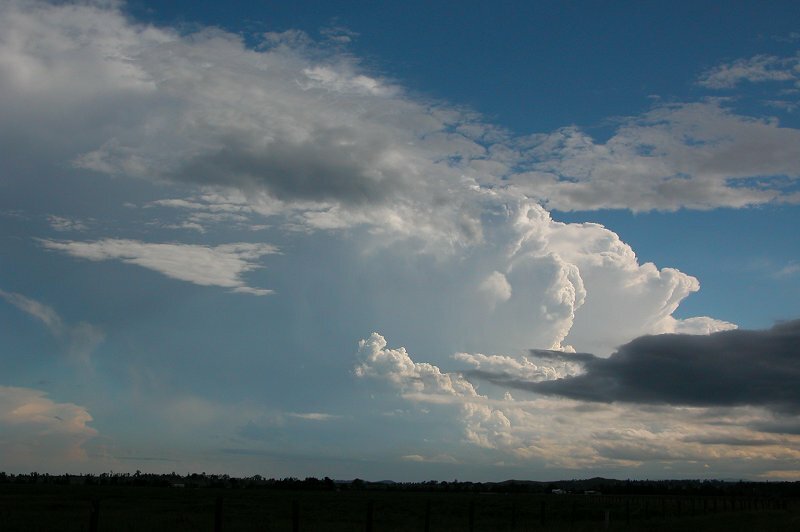 Activity all cleared offshore by mid afternoon, but around 7pm, more cells formed over Coffs Harbour and moved NE. 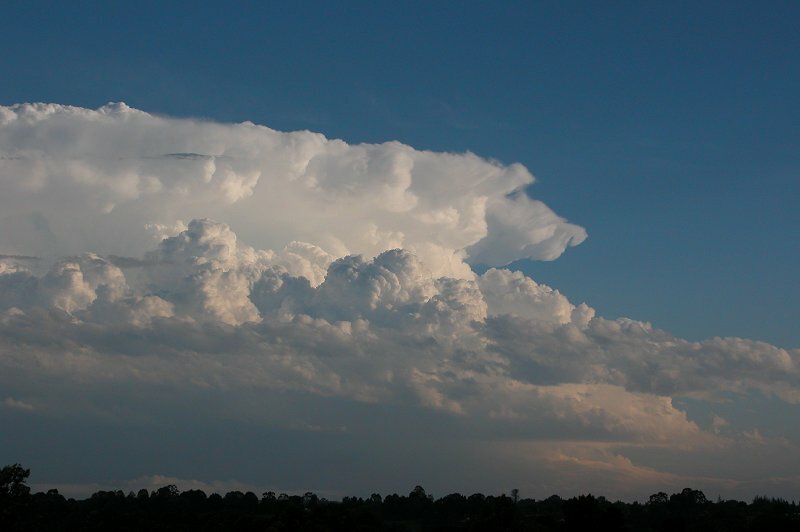 These cells developed into a large cluster of storms, with massive red cores. 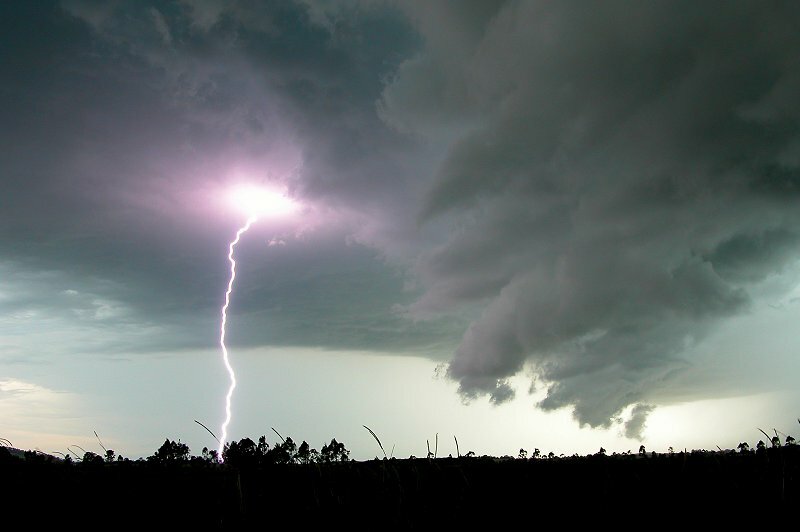 Frequent lightning was observed for a number of hours. With the bulk of instability inland according to the models I wasn't overly confident of any activity occurring, however standing outside in the morning it was obvious the atmosphere was unstable! 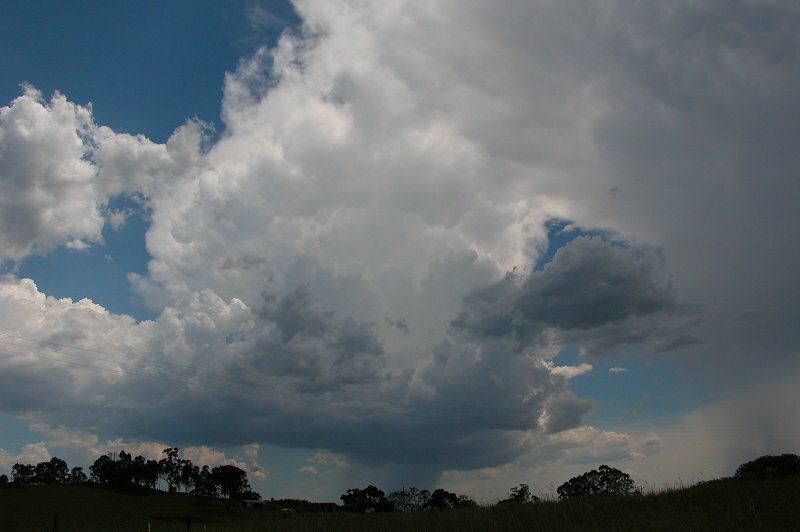 By late morning a heap of convection was occurring around the Northern Rivers district, but was mainly pulsey as shear was quite weak. 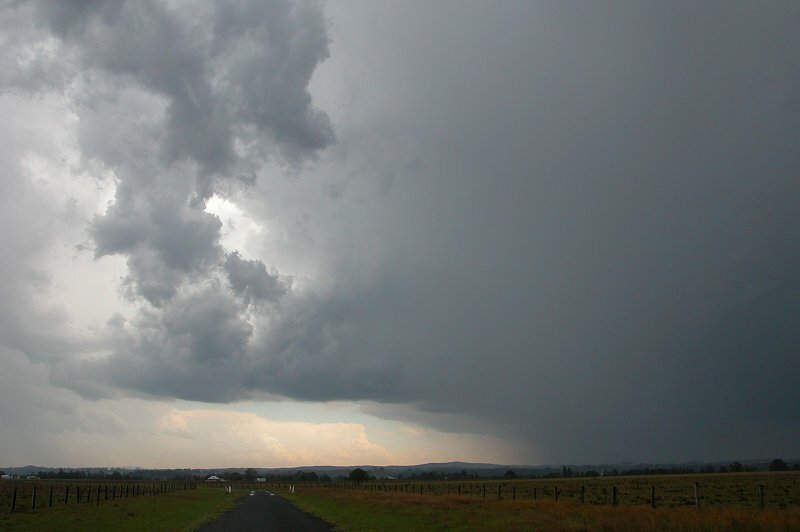 By mid afternoon a nice storm near Grafton was beginning to look a little more organised and headed toward Evans Head. This turned into a line with a nice gustfront, but was unfortunately not captured before it weakened. However another cell developed and tracked through Lismore dumping very heavy rain and some small hail, forcing the Lismore Show to close! Best of all it had a large guster which was great to watch from just down the road of my home in Wollongbar. This day looked set to go off! Instability was quite strong, there was excellent shear for supercells and plenty of low level moisture with a dry mid and upper level atmosphere. There was however one great concern.....cloud! 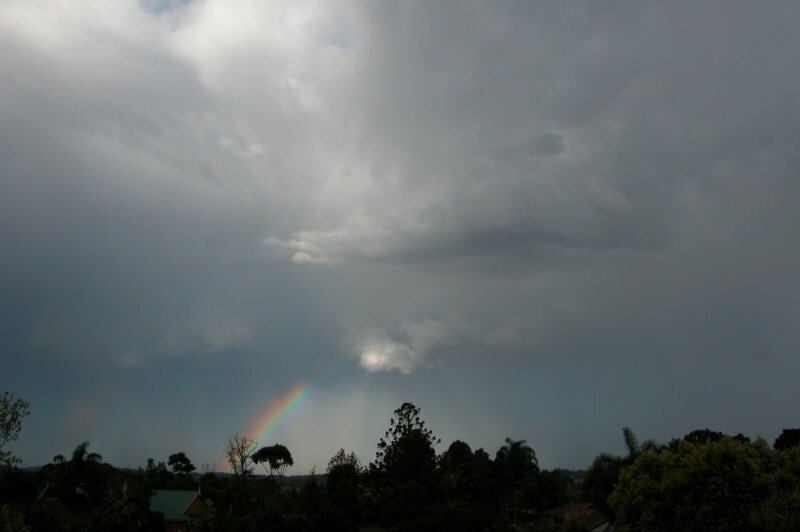 A rain band which came through during the morning gave around 30mm of rain and some lightning. However it cleared much later than expected, and didn't move offshore until after lunch time. From this point the sky looked to dry up too much, with a few turkey towers on the ranges evaporating as soon as they went up. Whilst thinking all was lost, Michael Bath and myself had pondered what the approaching S'ly change would do and held a small hope that a triple point would form near the coast. 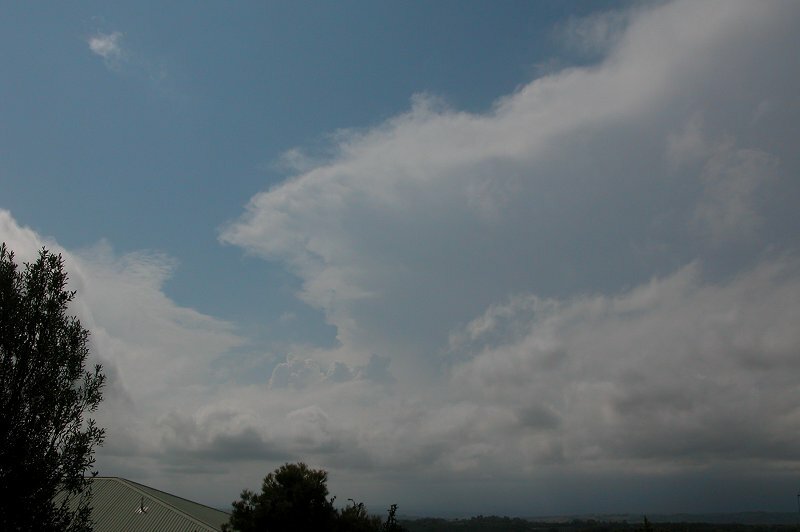 Just after 4pm a weak cell just NE of Grafton developed and gave a nice thick orphan anvil. It's updrafts looked stronger but again they seemed to be evaporating. 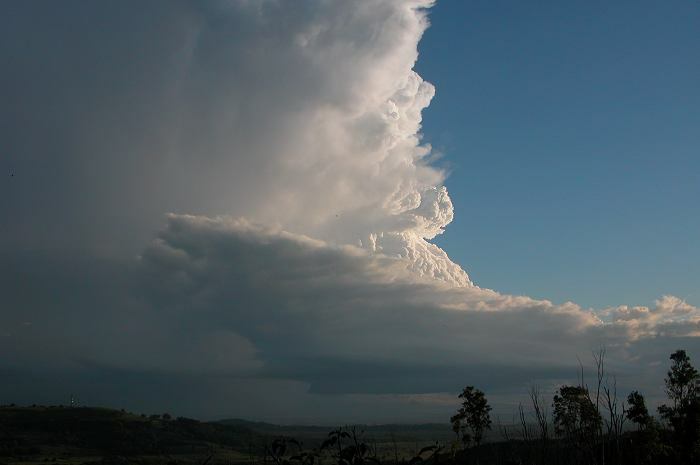 However one very solid updraft at 5pm prompted me to head out for a closer look, and over the next hour, one of the most beautiful LP supercells ever captured in Australia exploded and moved towards Alstonville. One of the most amazing sights I have ever seen!! Make sure you check the report for a full set of photos. It was shaping up to be a few big days of chasing, with this day looking pretty nice. LIs were around -8 with cape around 2500. Perfect for large hail. However shear was on the weak side and there was a little bit too much upper moisture for my liking. But severe storms were looking definite. 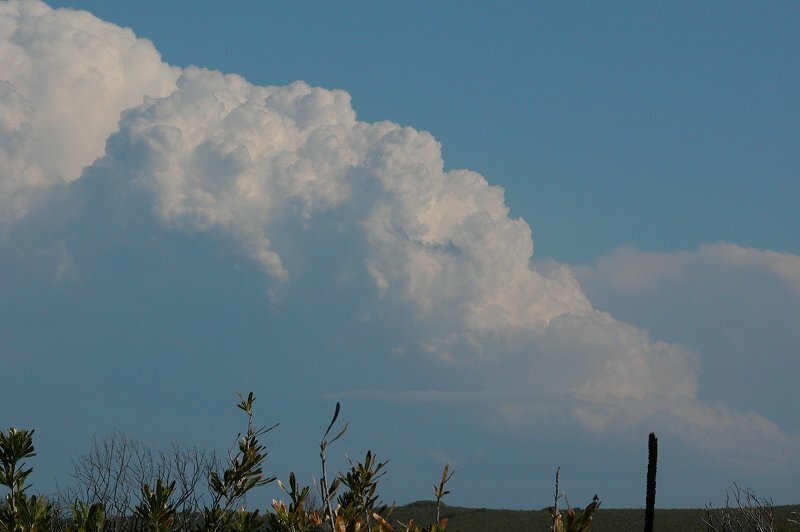 Storms popped up on the ranges everywhere late in the morning thanks to a weak cap. I followed some activity that formed on the Border Ranges and tracked down west of Casino. The cell I watched was VERY lightning active (thanks to the high cape) with some strong pulsating bolts. 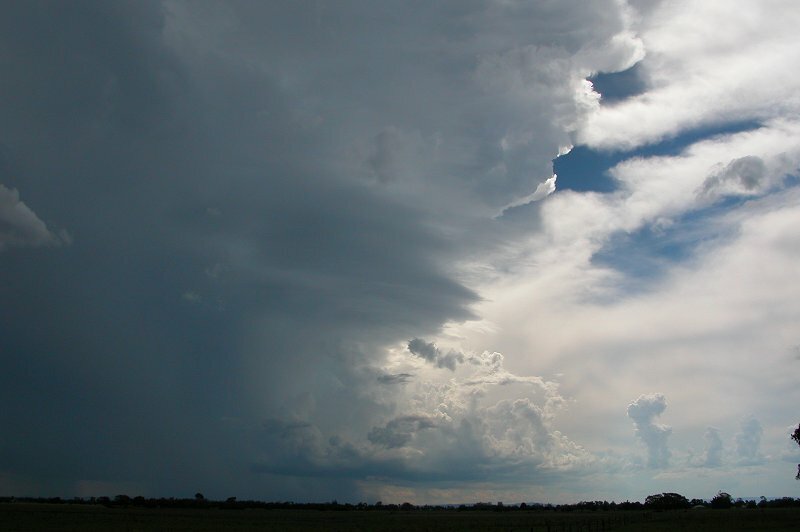 I entered the cell just east of Mummulgum and copped a heap of 2cm hail, with some stones getting up to around 3.5cm. Further west at Tabulum a stronger cell produced golfball hail with caused some damage in the town. A large thundery rain band developed by late afternoon and gave some nice rainfall and infrequent lightning into the night. The day looked set to go off! LIs were -8 to -10 with cape up around the 3000 mark. Slightly stronger shear than the previous day, with good low level turning, and a stronger cap meant we were in for an exciting afternoon! Development didn't kick off until around 2.30pm and we watched a supercell develop from a tall, thin Cj into a beautiful LP supercell at Mallanganee. From there we got to sit under the rain free base and experience isolated giant hail falling!! It was an eerie feeling seeing giant hail fall with no rain falling at all! 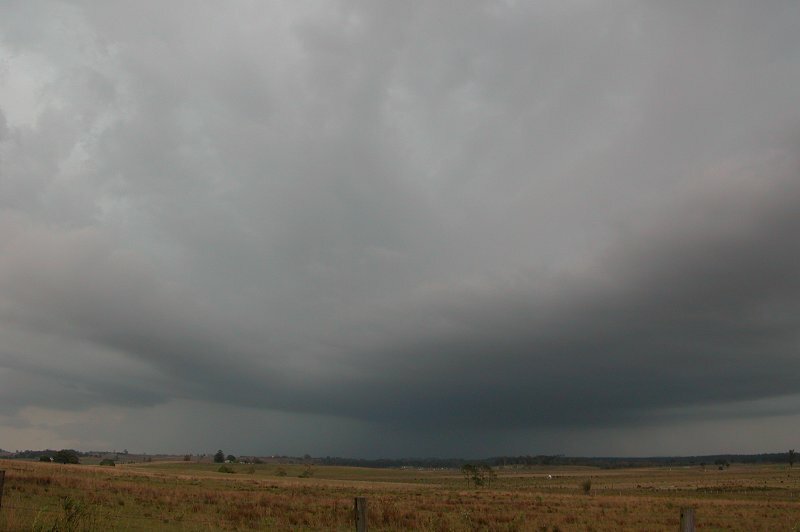 The slow moving nature of this supercell meant we could travel around to just SE of Kyogle and intercept it a second time, witnessing hail up to 6cm, possibly 7cm falling on the road in front of us!! As the supercell eventually weakened over 3 hours from its first updraft, a large line of storms moved into the Northern Rivers and gave an amazing lightning show with more heavy rain, gusty winds and hail! One of the best chase days ever!!! Strangely enough, what was probably the closest to the 'perfect' setup I had ever seen didn't in fact give me the best chase day I've ever had. The atmosphere was very unstable, with LIs down to -8 and cape over 3000. Shear was incredible - very strong in the low and mid levels with excellent low level turning. And the moisture profile was also great. It was one of the first setups in the local area where tornadoes and giant hail would be a very high possibility. 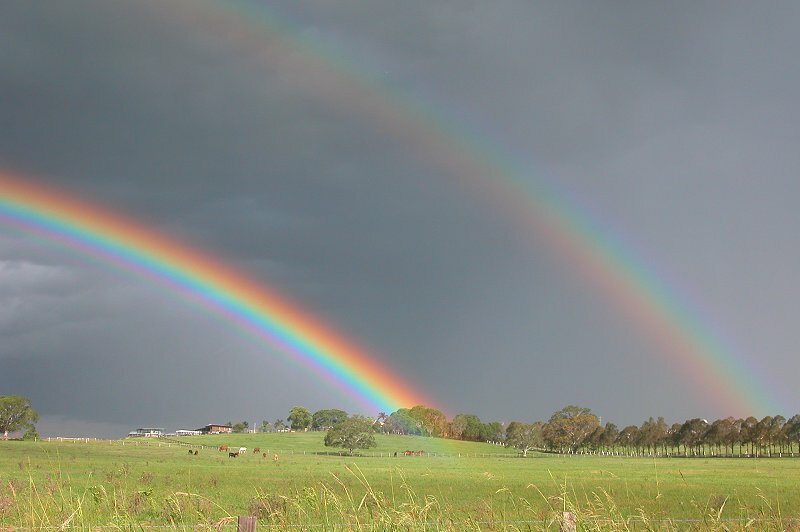 Unfortunately the best storms formed everywhere around us, with hail over 10cm in size near Maclean in the Northern Rivers, a large hailstorm with cricket ball hail on the Gold Coast, and an F2 tornado, which looks amazing in photographs I've seen, at Stanthorpe! 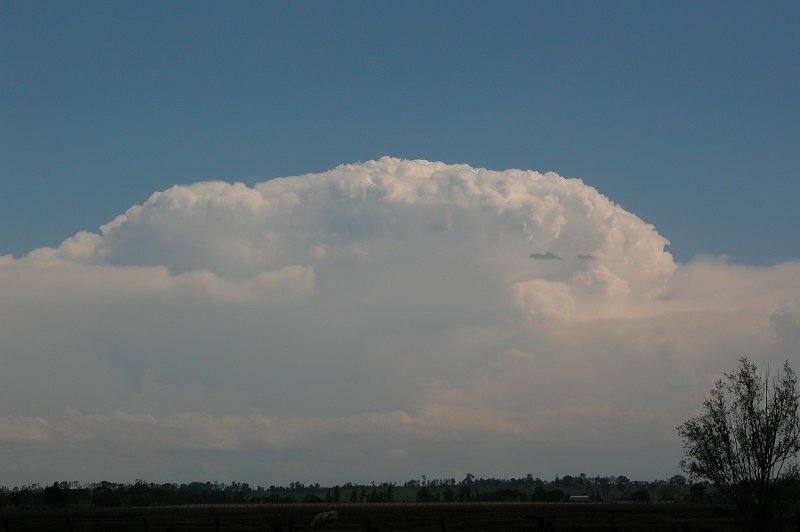 Michael Bath and myself did get to watch a number of cells throughout the day, particularly enjoying watching the supercell near Maclean that gave 10cm hail just explode, but we didn't obverse any amazing structure close by. 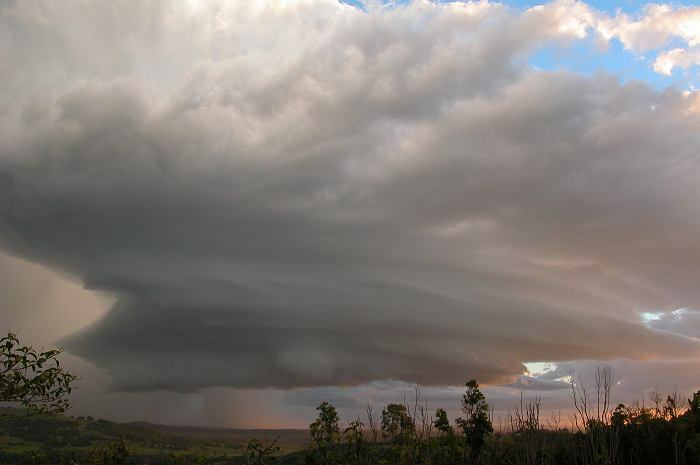 No doubt many millions of dollars worth of damage occurred from the Mid North Coast up into Eastern Queensland and the day will be remembered as one of the biggest supercell outbreaks in quite a few years. 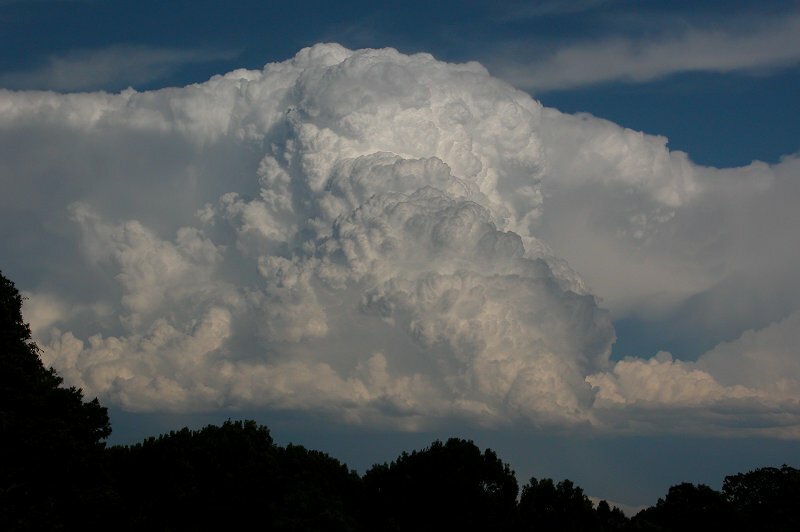 Although a very strong cap prevented surface based convection, an unstable atmosphere above the cap meant convection was still able to occur above the cap, leading to very high based, dry storms. 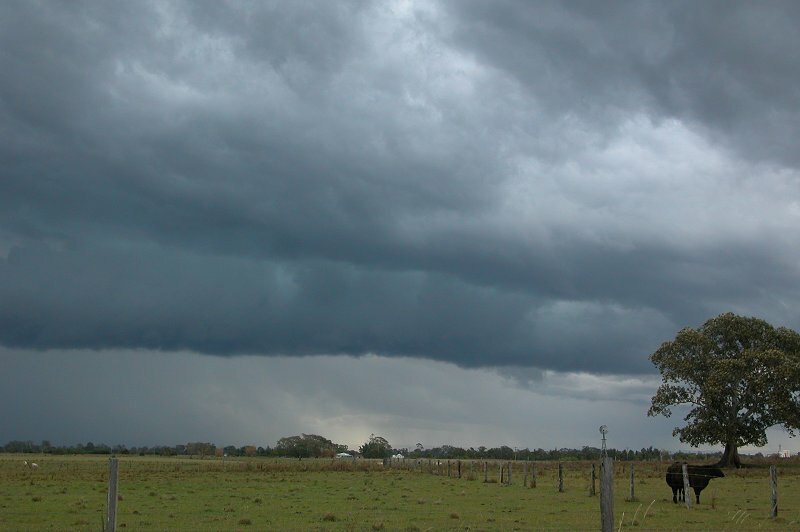 The line of storms that formed in S QLD gave some very strong winds on the Darling Downs, but when reaching the coastal moisture the strong dry microbursts they were producing ceased, leading to just some showers as they moved though. The line was very lightning active however, and with the line extending just over the border, I managed to snap a few lightning pics late at night as it moved passed to my north. In an unwelcome reminder of the massive dust storm to hit the area last October, I awoke in the morning to a thick dust haze. 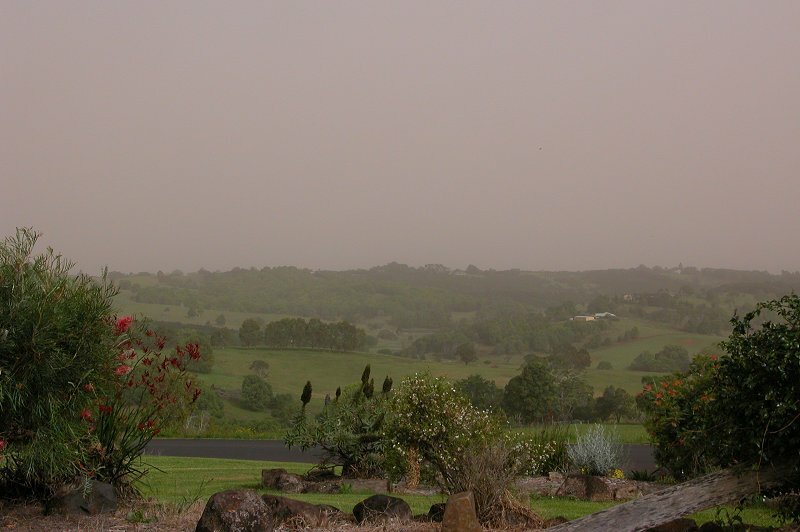 Strong westerly winds ahead of a change had whipped up tons and tons of dirt from the still drought stricken inland NSW. It was amazing to see this occur after experiencing a similar dust storm, although much larger, last October. It came as a reminder though that while our area was no longer in drought like it was last year, inland NSW was still doing it tough. The dust cleared by that night. 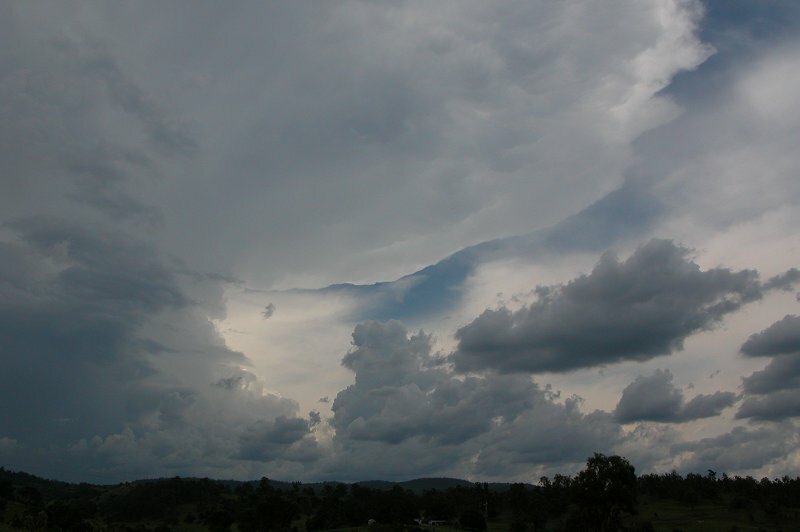 With fairly weak shear and marginal instability, it was unclear whether we were going to see much in the Northern Rivers, however by around 5pm, weak activity had developed S of Lismore. 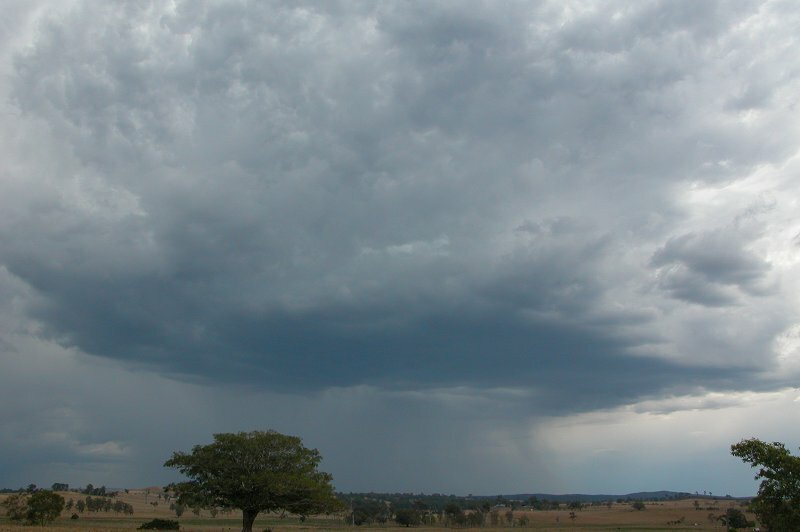 It was high based and fairly weak, however, as it weakened S of Lismore, another storm developed on it's NW flank, which moved over Kyogle, causing minor damage to homes and giving a much better show of both structure and CG lightning! As it moved over the border to Queensland, the sun brilliantly illuminated the large anvil backshear, presenting a lovely show of mammatus! The storm weakened soon after sunset. Another day with marginal instability, however wind shear was actually alright this day. I had dismissed the chance of any substantial storm action because of the lack of instability, but by lunchtime, a weak storm had developed nearby and moved over the area, clearing NE towards Byron. The real shock came at 5.30pm when a weak storm popped up near Byron, heading SE, with some interesting visual features. Further to this, another cell popped up NNW of my home in Wollongbar and proceeded to head SE, eventually developing quite nice updraft rotation. 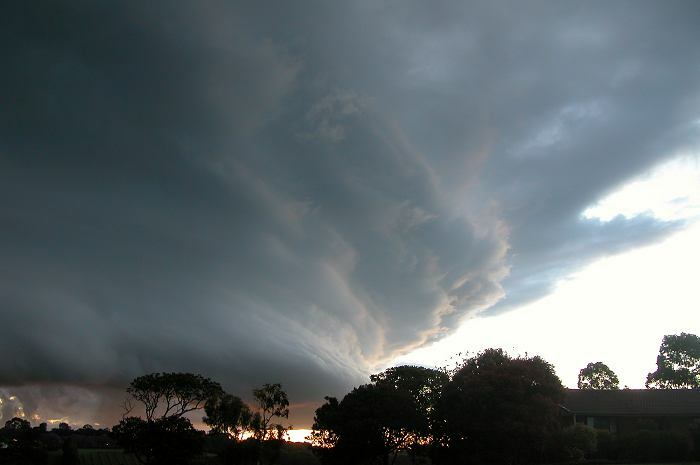 Whether it could be called a supercell is unclear, but it was amazing to look at! Later that night at 9.30pm, more storms developed and moved NNE through the Lismore area, giving a great light show, along with some small hail! Quite an amazing day given the conditions! An intense cold pool had moved into N NSW, dropping 500hPa temps to -21C!!! Wind shear wasn't ideal, with SE surface winds, however mid-upper level winds were strong, so stuff was going to move! 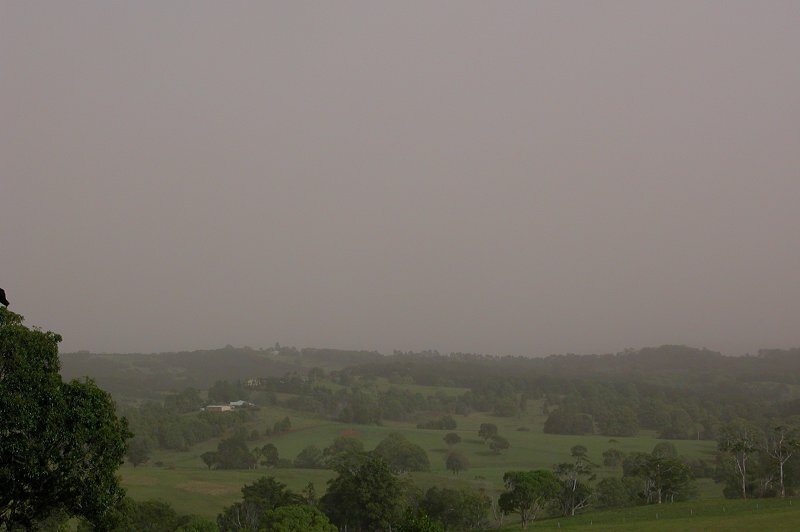 Severe storms developed around lunchtime throughout the Northern Rivers area. Nothing really stood out visually, but many areas received hail thanks to the very cold mid to upper levels. Strong instability, loads of atmospheric moisture, a weak cap and poor wind shear lead to an interesting afternoon of storm activity. Storms rapidly developed at around midday over the Lismore area and proceeded to give around 6 hours of rain, lightning and thunder. With so much stratocumulus thanks to SE surface winds, storms were almost entirely featureless. With CGs occurring in the Lismore area for around 6 hours, it was not surprising that one house in Goonellabah, just outside of Lismore, was hit by a CG, causing extensive damage to the corner of the house where it hit. Fortunately no one was home at the time. 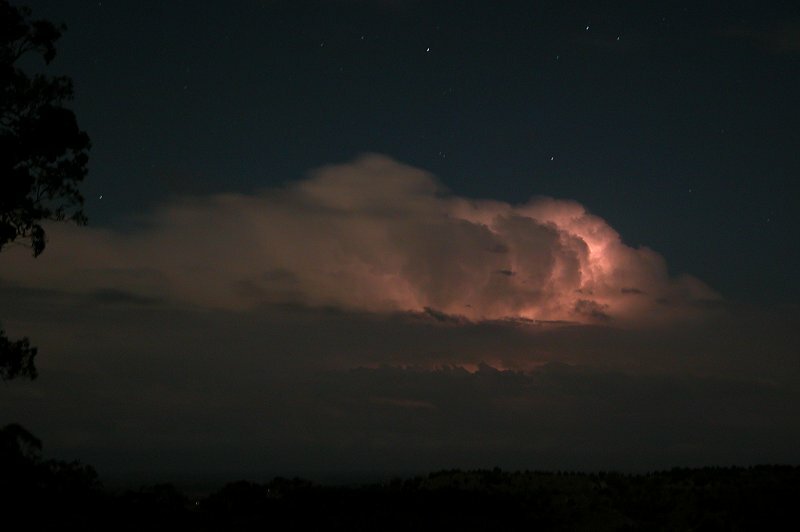 Further storms developed and gave some offshore lightning later that night. 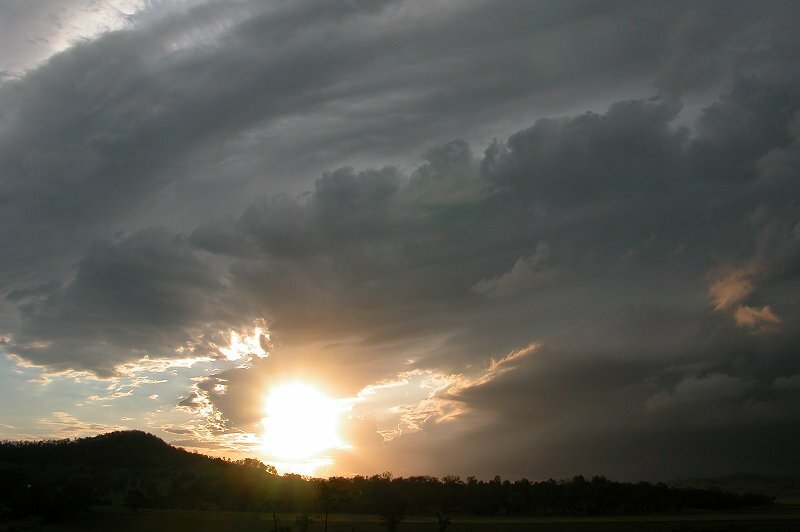 Continuing with what has almost become a tradition in the last few years, Christmas day in the Northern Rivers was oppressively hot and humid, with storms developing in the inland areas. 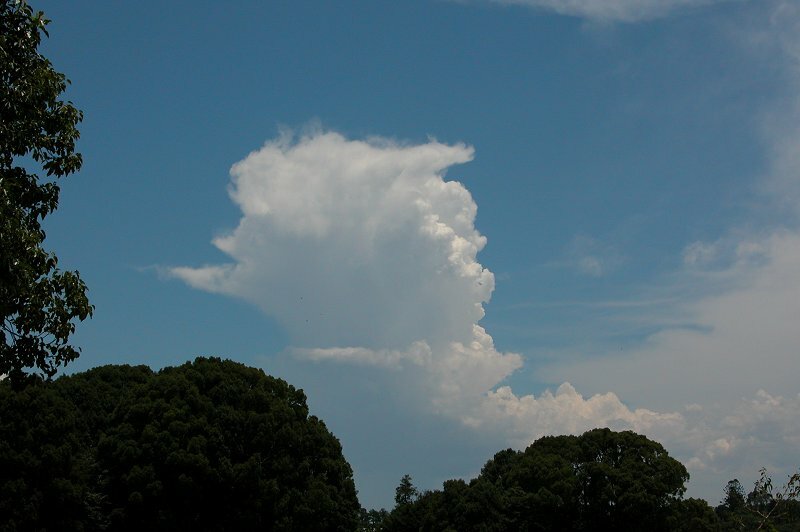 In fact quite a nice multicell formed right over Kyogle during the afternoon in the high 30's heat (not to mention the DP of 25C!!!). Further storms developed on the Nightcap Ranges during the evening, but nothing appears to have been severe or long lasting. Boxing Day held some hopes of severe storms, with low LIs, high CAPE, and plenty of surface heating. However with very dry mid to upper levels and weak shear, along with some capping, long lasting activity failed to get established. 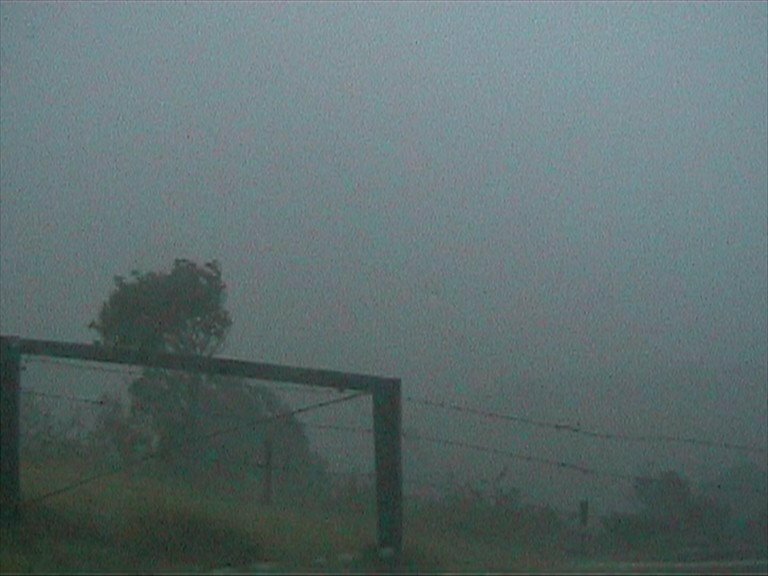 Still, some severe storms which brought down large trees affected the Northern Rivers area, giving an entertaining afternoon of storm chasing! Some very weak storms were slowly moving NE into the Northern Rivers during the evening. I headed out to a lookout to observe a weak gustfront feature and some lightning. The storm was not severe and collapsed before it made it to my location. 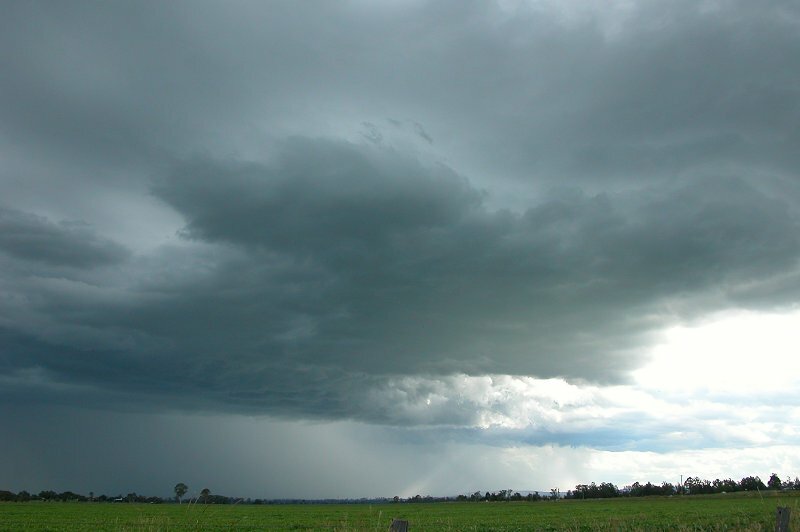 A line of weak storms which stretched from NE NSW into SE QLD moved through the area during the late morning, bringing some gusty winds and very heavy rainfall. The storms didn't have a great deal of structure, but did begin to develop a gustfront as they reached the coastal areas. The line seemed to intensify as it moved offshore, with regular thunder observed after the cell had passed over the area. After a very quiet summer so far, a decent trough system finally moved into NSW, brining with it severe storms in the Sydney region and north along the ranges. By dusk, storms had developed on the Northern Tablelands, and some cells were moving towards the Northern Rivers/Northern Tablelands border, giving plenty of lightning! So the Northern Rivers chasers went out to just east of Casino to observe the activity in what was a 'test chase' to get us back into gear for what was to become a nine day outbreak of storms in the area! Plenty of instability and ok mid and upper level winds set the stage for an afternoon of severe storms in the western parts of the Northern Rivers. 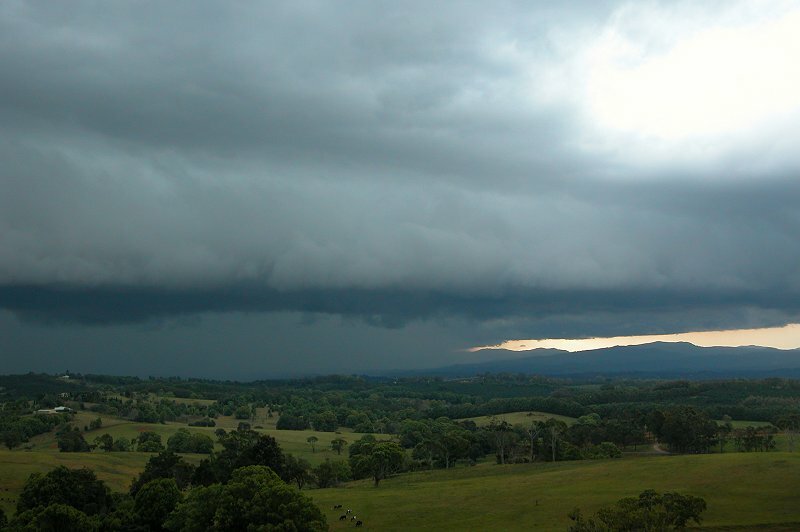 After a few pulse storms, a nice line got organised just south of Mallanganee during late afternoon, moving NE towards the Kyogle area. 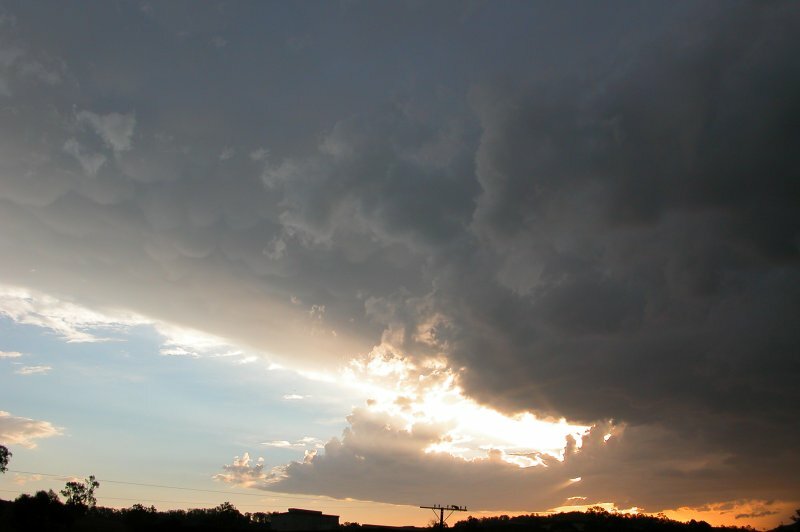 The storm featured a spectacular gustfront and plenty of pulsating CGs, along with very heavy rain and some 2cm hail. 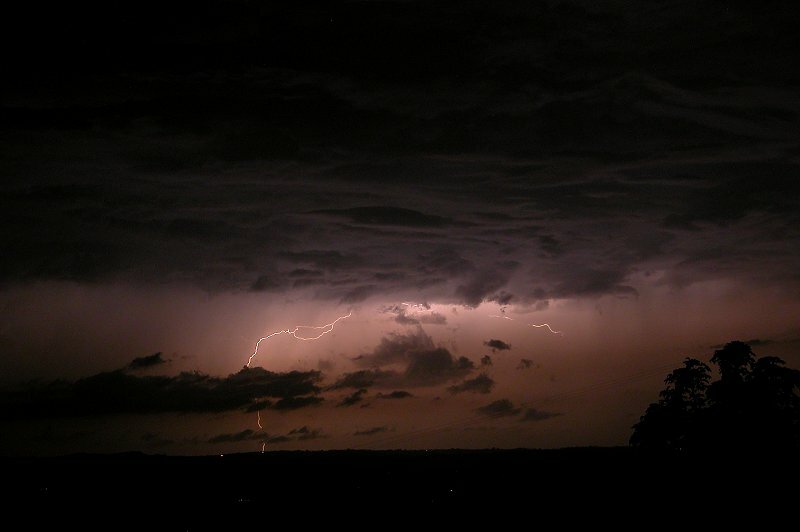 Widespread lightning active storms developed into the evening, though were obscured by low cloud. A slightly better moisture profile from the day before saw greater expectations of hailstorms. 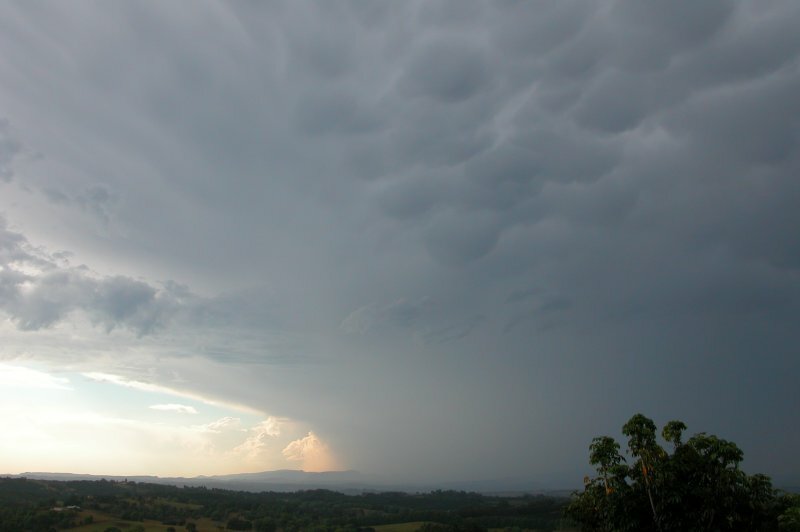 By mid morning a line of storms had formed near Dorrigo and slowly progressed NE towards the Lismore-Ballina area. 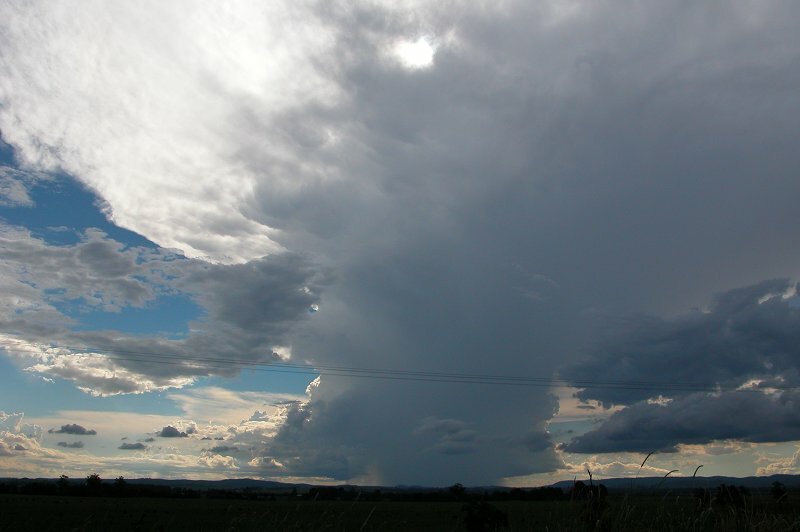 Meanwhile a storm developed on the Richmond Ranges and kept chasers entertained whilst waiting for the main activity to push up from down south, however it never moved off the ranges and developed into anything spectacular. Chasers intercepted the stronger activity at Coraki, experiencing severe winds and very heavy rainfall, although much to our disappointment, only a little bit of small hail. 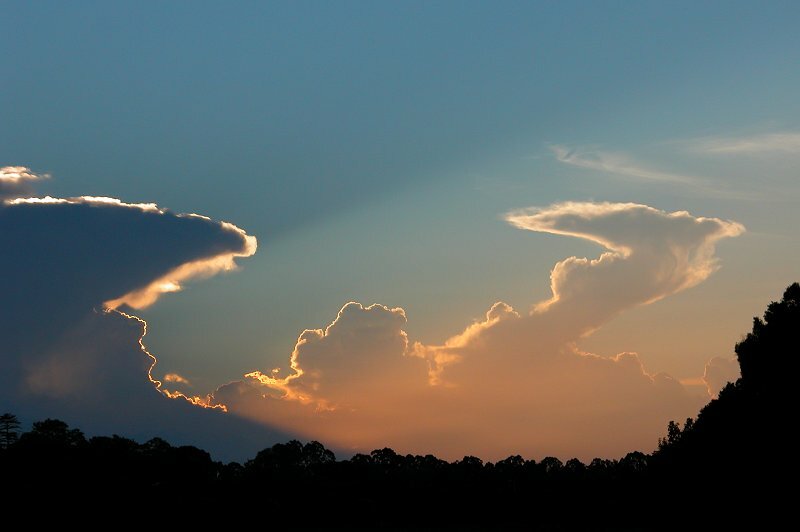 Once again, further weak storms developed into the evening. The setup was similar to the previous day, though with more upper level moisture and a stronger cap. After a large area of cloud cleared, activity kicked off in the same spot as the day before on the Richmond Ranges. 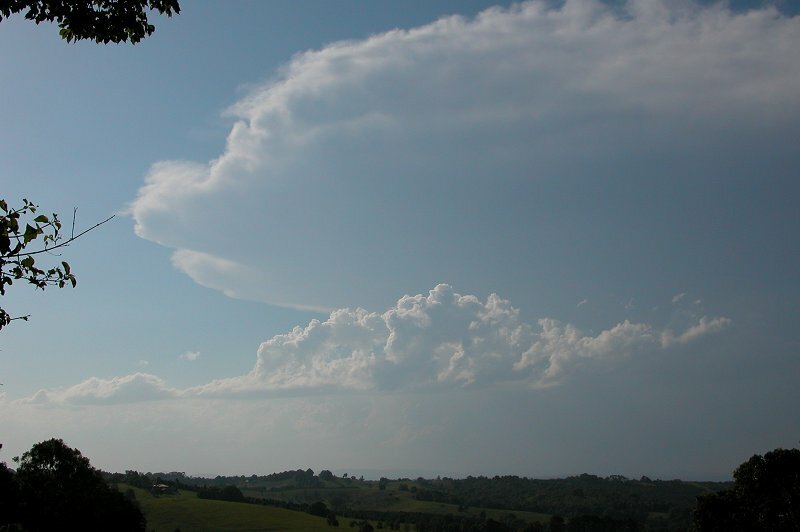 Strong updrafts and a solid anvil signaled just how strong this storm was. 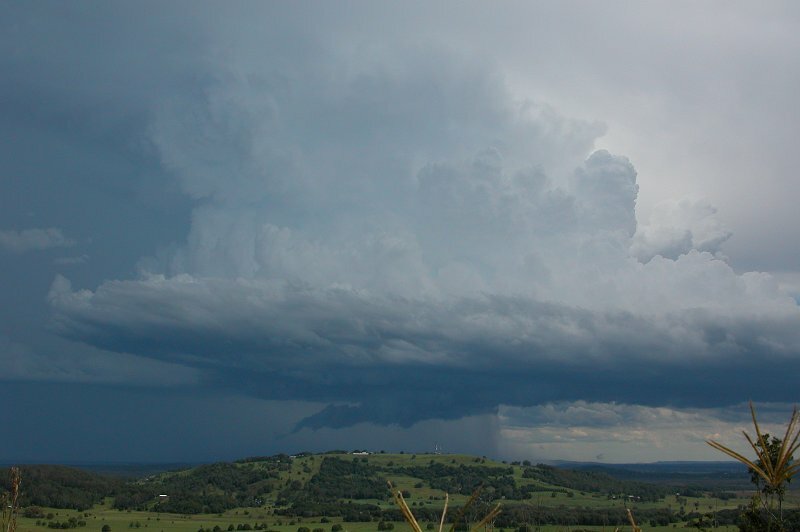 It went on to produce a photogenic gustfront for Michael Bath at McLeans Ridges and later presented HP Supercell characteristics for chasers watching from the Potsville area. By evening a large rain area had developed over the Northern Rivers and did not clear till the early hours of Monday morning. 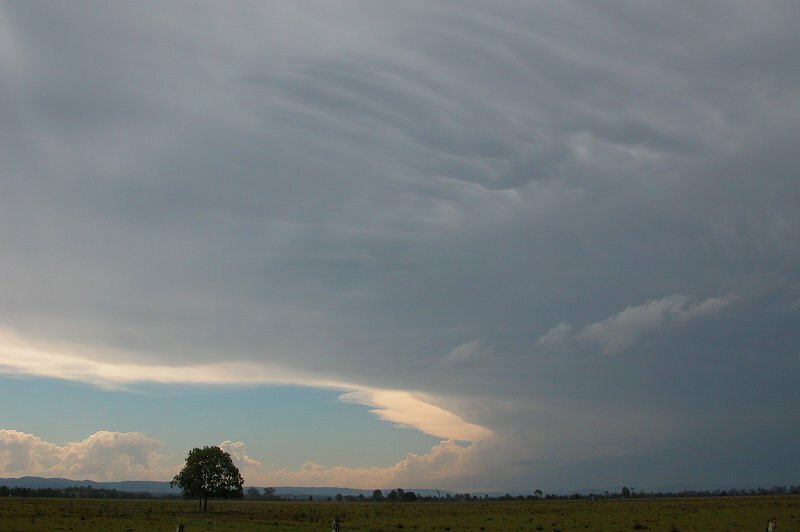 With a dryline sitting along the Northern Tablelands and strong instability, not to mention 180 degree turning of the winds, there were high expectations of supercells. However a strong cap seemed to keep activity suppressed well into the afternoon. 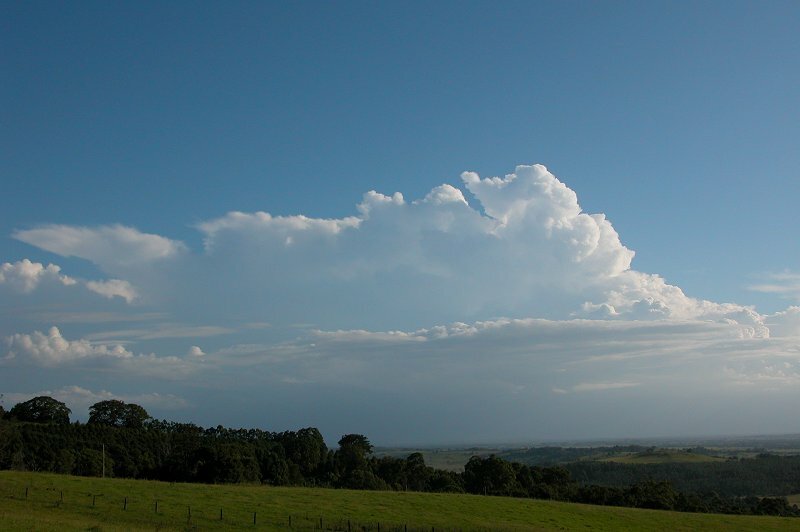 A storm developed W of Kyogle and slowly progressed towards Queensland. 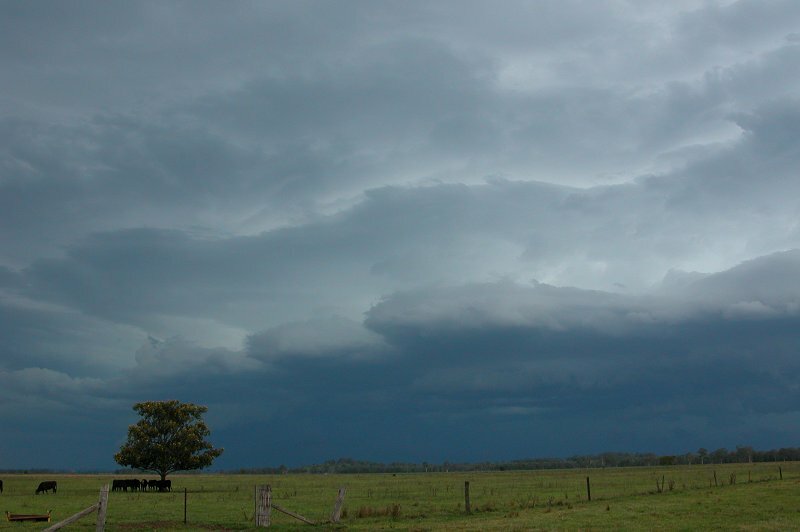 It didn't appear to be very impressive from our angle, however it developed into a Supercell as it moved into SE QLD, and exhibited amazing structure for storm chasers in the area. Meanwhile attention turned to two cells in the area, one west of Grafton moving NE, and a splitting storm (possibly a supercell) to our west on the Richmond Ranges. It was amazing to watch the one storm completely split, however the right mover collided with the cell near Grafton and both cells ended up collapsing. A very strong cap held down activity until after 5pm, when a possible supercell split west of Kyogle, with the right mover heading SE towards Casino. 3cm hail was observed just outside of Casino, however it weakened quickly as it slid just east of Casino. 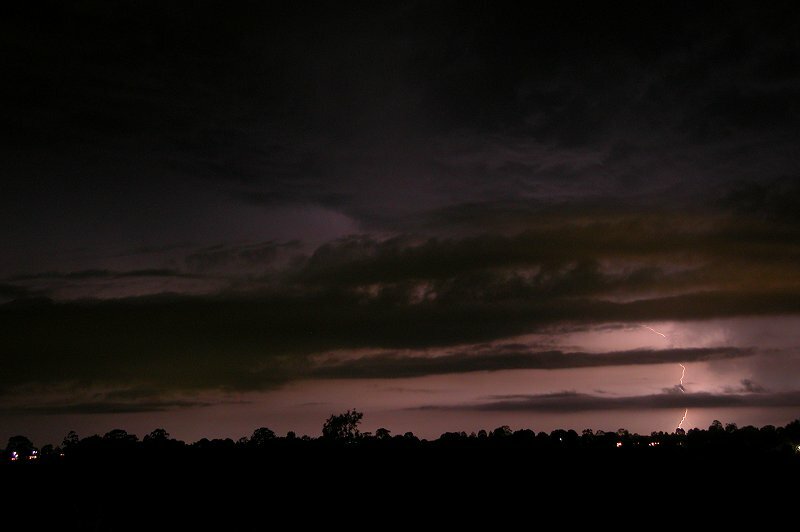 Further lightning active storms developed in the area and gave a spectacular light show well into the night! 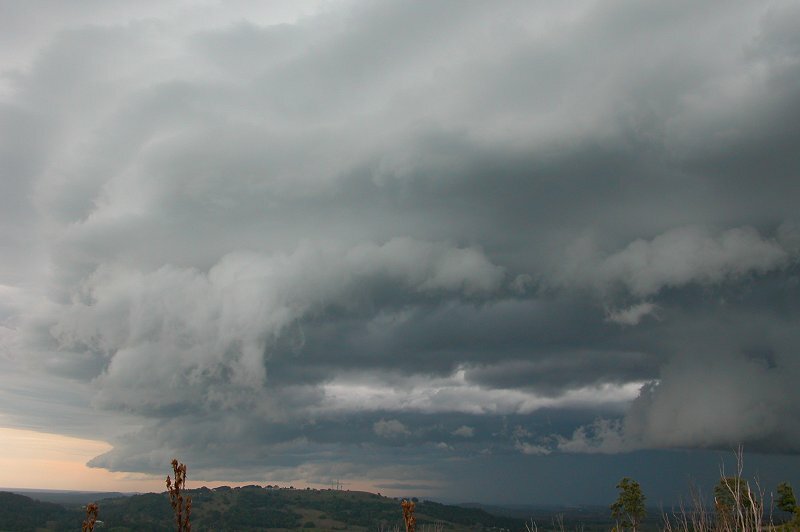 The atmosphere was very unstable thanks to a nice upper trough and shear was good at all levels. Unfortunately it was very dry apart from the very low levels, so activity which developed was very high based. Very powerful updrafts exploded along the coastal fringe by late afternoon, with storms becoming severe as they moved out to sea. One very strong supercell which had moved eastwards out to sea east of Grafton eventually veered north and gave a very large area of red on radar. At one point the cell moved NNW, and ended up passing just off the coast of Ballina. 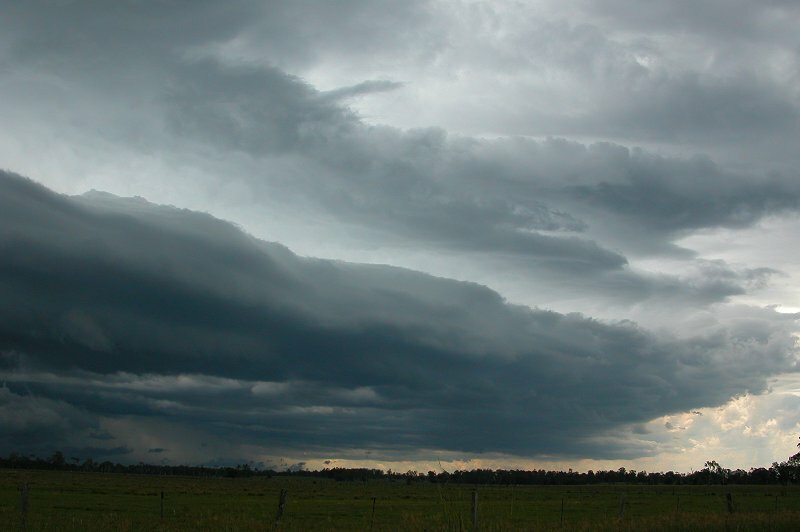 A large inflow band was observed feeding into the base of the storm and was quite spectacular! The storm gave some spectacular lightning off the coast into the evening. 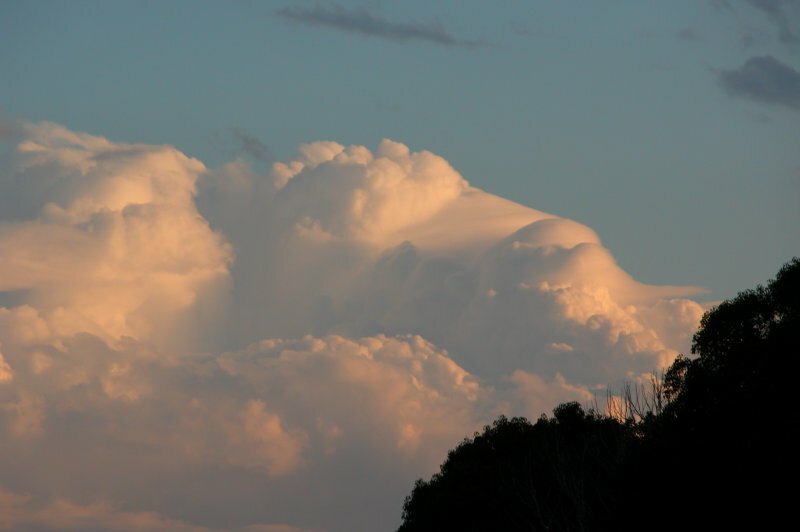 A strong cap and dry low levels saw weak storms develop late in the day, but they did not last long and dissipated as they moved into the Lismore area. 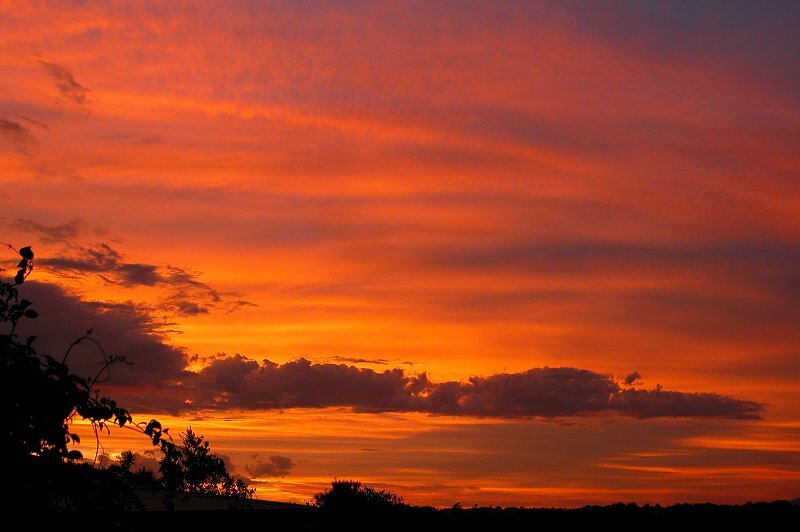 Still, an intense sunset was observed thanks to all the high cloud! Whilst the models had progged all the moisture and instability to have moved offshore, instability and moisture was ideal in the coastal area. 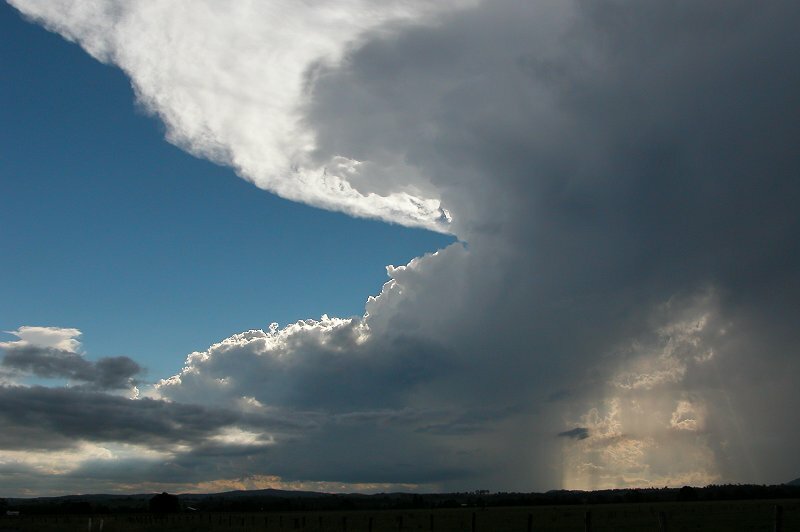 And with very strong wind shear and excellent turning, it ended up being no surprise that an impressive supercell developed and produced not only hail up to 7cm, but also produced a funnel from the very fast rotating mesocyclone. It was the fastest rotation I had observed and was amazing to watch! It was also great to go in and play in all the giant hail just outside Evans Head after the storm had passed. It was an excellent way to end nine fantastic days of storms! A low which formed in the Coral Sea rapidly deepened as it quickly moved towards the SE QLD coast on the Friday, bringing with it gale force winds, very heavy rain, flash flooding and huge seas. 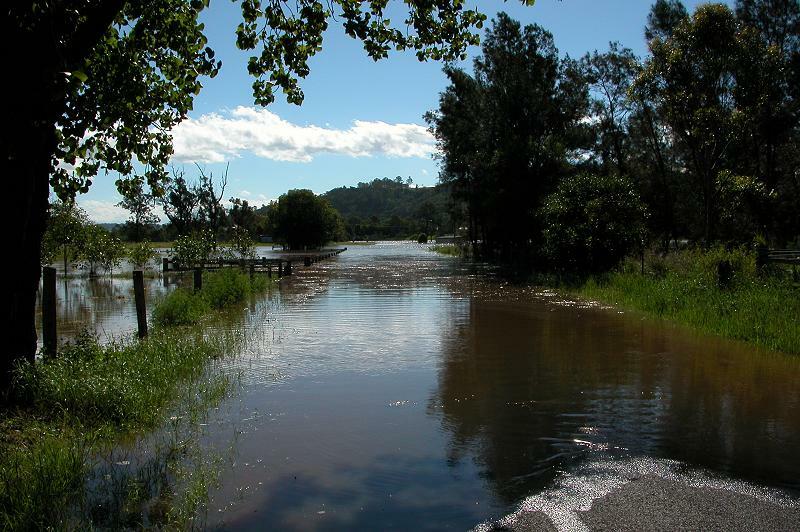 The NE NSW coast from Coffs Harbour to the Queensland border copped winds up to 120km/hr during the Friday evening and early hours of Saturday morning, and the heavy rainfall overnight led to moderate flooding of the Wilsons River at Lismore late Saturday night. 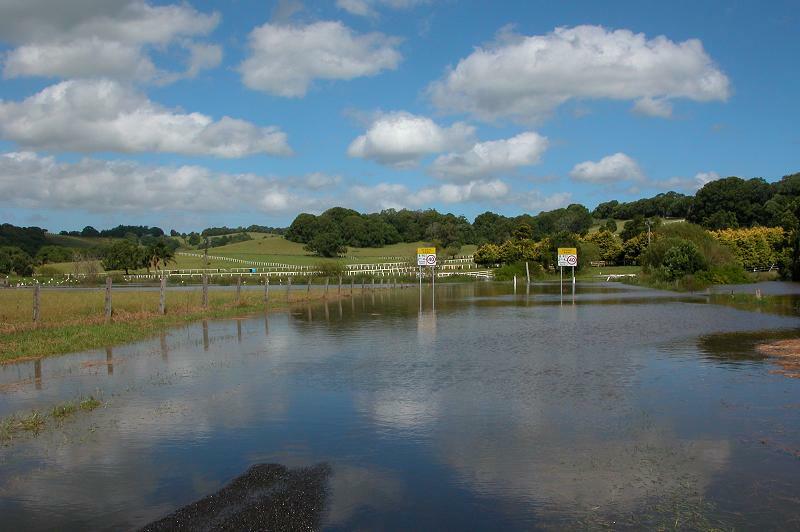 Low lying areas around Lismore were inconvenienced by the flooding by Saturday afternoon, and weather enthusiasts in the region spent a few hours doing a 'flood tour' of the area. 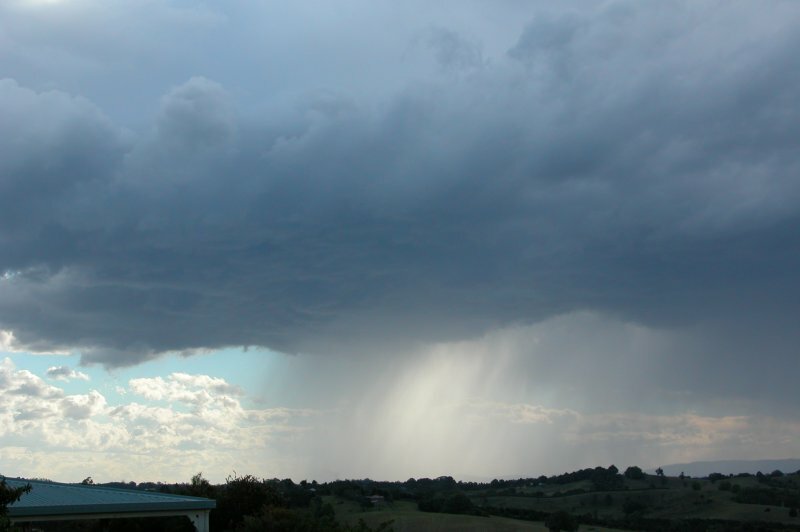 What could be better described as a strong shower than a weak storm moved into the Northern Rivers area during the late afternoon. The very slow moving, low topped cell produced quite an impressive gustfront despite being very weak. It gave some very heavy rainfall, no doubt into the severe category, but no other severe weather was experienced. 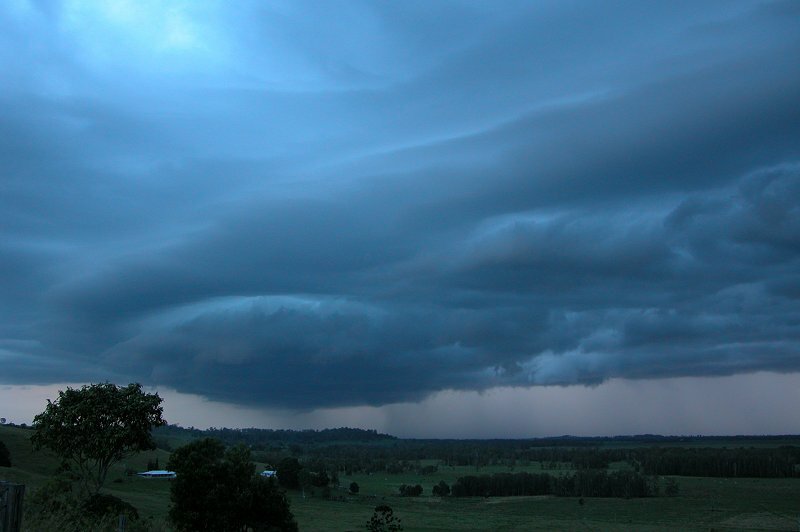 The cell collapsed S of Lismore by evening. The last chase of the season saw a nice upper trough produce a severe possible HP supercell! As the line moved through the Lismore area it gave winds over 100km/hr, torrential rain and lots of 2cm hail in an isolated area. 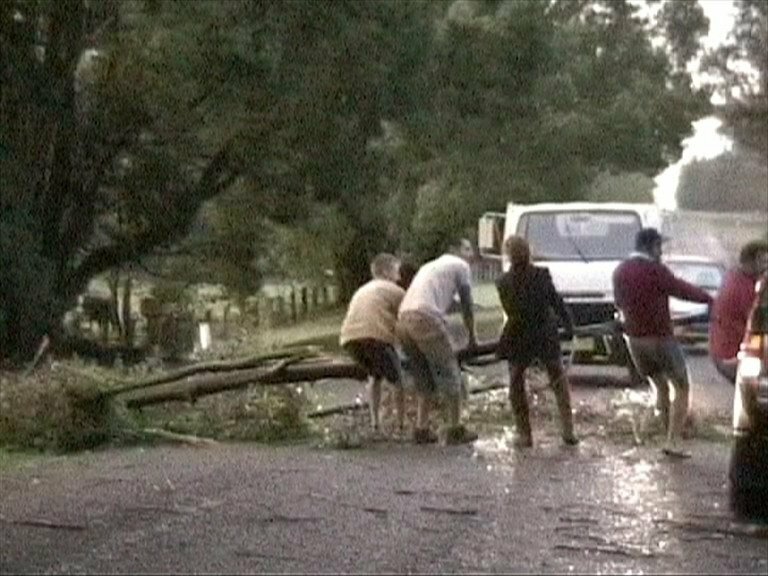 The real damage occurred as the storm passed over Murwillumbah, with a number of houses having their entire roof ripped off by the very strong winds. 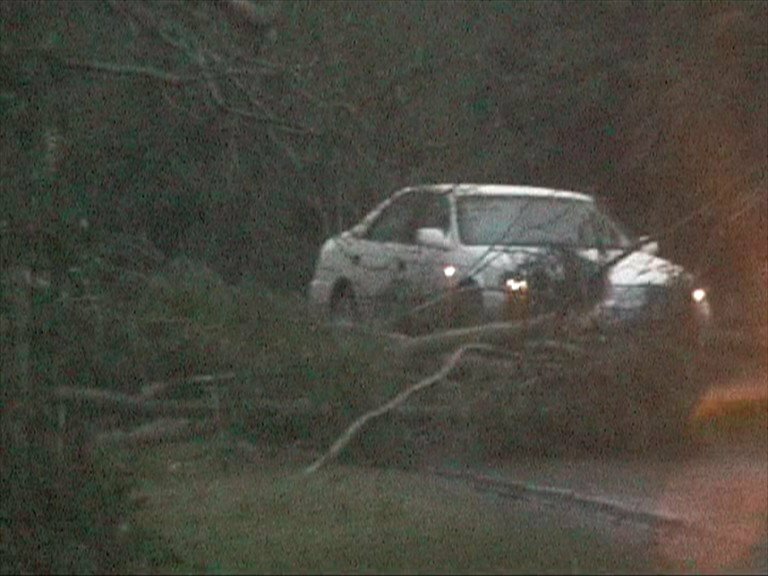 It was an amazing storm to experience as we encountered the very strong winds south of Lismore, and a top way to end the storm chasing season of 2003/2004!